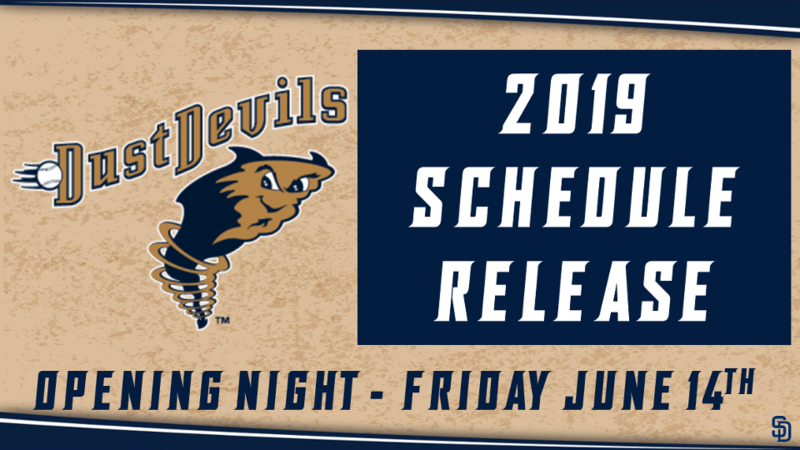 The Tri-City Dust Devils and the Northwest League have released the schedule for the 2019 season. The Dust Devils will open at home against the Everett AquaSox, the Seattle Mariners affiliate, on Friday, June 14th. Tri-City will end the season at home Monday, September 2nd versus the Spokane Indians, Other highlights in 2019 will include the annual July 3rd game, six Friday and six Saturday home games. The Player Development Contract with the San Diego Padres was extended through the 2020 season and the 2019 season will mark the fifth year of the Dust Devils affiliation with the Padres. Eleven of the Padres top 30 prospects have called Gesa Stadium home including shortstop, Fernando Tatis Jr., right hander Cal Quantrill and left hander Adrian Morejon. The Northwest League vs. Pioneer League All-Star Game will return for the 2019 season. Last season the All-Star Game was hosted by the Grand Junction Rockies. Five Dust Devils were selected to represent the Northwest League including infielders Owen Miller and Olivier Basabe, right handers Henry Henry and Jordan Guerrero, and left hander Dan Dallas. The 2019 All-Star game will be hosted by the Boise Hawks on Tuesday, August 6th. The Dust Devils play in the Northwest League North division along with the Everett AquaSox, Spokane Indians, and Vancouver Canadians. The South division is comprised of the Boise Hawks, Eugene Emeralds, Hillsboro Hops, and Salem-Keizer Volcanoes. The 2019 schedule is following a different format that will allow for more in division games. Once again, the Northwest League season will be divided into a first half, which ends July 22nd, and a second half which ends September 2nd. The winners of each 38-game half in each division advance to the Northwest League playoffs. A total of 86,283 fans enjoyed Dust Devils baseball at Gesa Stadium in 2018. The Dust Devils had four sellouts, eight games with over 3,000 fans and broke the single game attendance record with 3,830 fans on June 22, 2018! Fans are encouraged to secure their seats early by purchasing a ticket package. Mini plans of 7, 14, or 21 games feature the biggest nights at Gesa Stadium, including all Friday and Saturday night games. Ticket packages start at just $56, with full-season tickets available starting at only $285. Special ticket rates are available for groups of 20 or more. Season tickets, mini-plans, and group tickets can be purchased by contacting the Dust Devils front office at (509) 544-8789 or at the Gesa Stadium box office. A copy of the 2019 schedule is attached. Dust Devils Baseball....."It Will Blow You Away!"